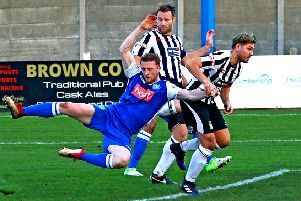 Lancaster City boss Mark Fell has challenged his side to ensure they are firmly looking up the NPL Premier Division table and not over their shoulders in the coming weeks. Having been rooted to the foot of the division just a few weeks ago, Tuesday night’s 2-1 win over Hyde United hauled the Dolly Blues up to 17th in the standings. They had slipped into the relegation zone when in FA Trophy action on Saturday though, something Fell wants to see the back of sooner rather than later. “On Tuesday night we had to drag ourselves out of the bottom three again because of teams playing their games in hand,” said the manager, whose side host Stafford Rangers at Giant Axe on Saturday. “But I don’t want to do that every week, I want to be in 16th going for 12th or in 12th going for ninth. “Then we can start to look up the table. “We were rock bottom six weeks ago so the fact we’re 17th does display progress. “But the warning shot is we’re nowhere near out of trouble and have loads of work still to do. “The difference is now this team have proved they can do it. Stafford are on the same number of points as City, 18, but are two places higher on goal difference heading into Saturday. Hyde are just two points above the pair after Rob Wilson’s double saw the Dolly Blues come from behind for victory last time out. “Hyde was a really important game for us,” Fell said. “We’ve dragged them into this little group of teams towards the bottom half of the table. “All of a sudden we can see ourselves that if we can get a positive result on Saturday then we’re in mid-table. “From where we were a few weeks ago that’s testament to the hard work of the players. “This wasn’t a bad side. “They had just not had the rub of the green and been on the wrong side of the margins too often and we knew if we could get a bit of reinvigoration into them which we’ve managed to do then things would turn. “We’re working at two points a game in the league and if we can maintain that we’ll be absolutely fine. “We set the lads points targets for each set of five games and we exceeded it for the first five and now this sets us up for the next batch of games. The comeback against Hyde came on the back of progressing in the FA Trophy on Saturday. The Dollies left it late to see off Ossett United, Charlie Bailey’s last-minute goal setting up a tie at home to National League North Guiseley in the third qualifying round on November 24. 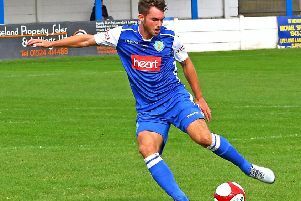 “After the previous Saturday at Witton we were really disappointed,” said Fell. “We just didn’t have the vigour or intensity about us and wanted a reaction and to be fair to the lads they gave us one. “Saturday was important because the Trophy has money attached to it which is vital to any club at our level. “There is no better way to win a football match than in the 94th minute and the strike that wins it is great as well.